Click here for the Chafing Dishes Menu in an easy printable form. 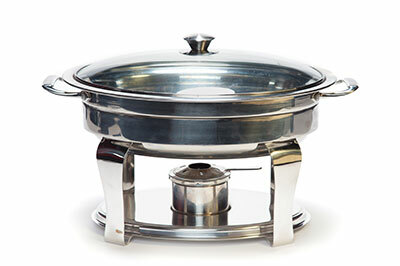 Add any side, appetizer or dessert to your chafing dish. Grilled filet medallions topped with a red wine mushroom sauce. Brisket smoked with a natural wood, sliced and then smothered with a sweet, tangy bbq sauce. 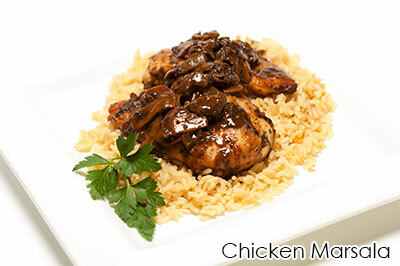 Grilled chicken breast topped with a marsala sauce and mushrooms. Grilled chicken breast topped with apricot glaze. Pasta tossed in a parmesan garlic alfredo sauce, topped with grilled chicken. Ziti pasta smothered in a zesty marinara sauce, blended with ricotta and parmesan cheese, topped with melted mozzarella. Penne pasta topped with marinara sauce, meatballs and asiago cheese.